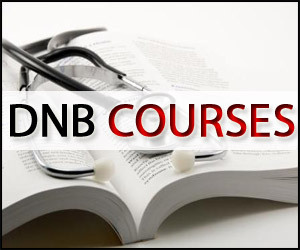 New Delhi: The National Board of Examinations (NBE) is going to provide hands-on training workshop for hospitals and medical institutions who are intending to apply for DNB Programme. The information to this effect comes via a recent notification on the official website of NBE which clearly stated that after a series of meetings held in PMO, in Niti Ayog and MoHFW, it has been decided to coordinate with the State Governments and all the central and state agencies/ institutions/ PSUs such as AFMS, Railways, ESIC, CIL etc regarding Scaling up Medical Education by enhancing capacity for training of Specialist utilizing District hospitals, AFMS hospitals, Railway hospitals, ESIC hospitals, CIL hospitals, other PSU hospitals etc. In view of encouraging greater participation of Govt hospitals across the country, a hands-on training workshop for PSU, CPSE, Municipal Corporations, Railway Board, ESIC run Govt hospitals is being organized by NBE on 15th of April 2019 at NBE Dwarka Office (PSP Area, Sector – 9 Dwarka), 11 am onwards. The workshop is likely to be over in 3 hours. It is requested to make it convenient to attend the same along with nominated representatives from each of the hospitals under your ambit. National Board of Examinations (NBE) administers postgraduate and postdoctoral course in various disciplines of modern medicine leading to the award of Diplomate of National Board (DNB) and Fellow of National Board (FNB). DNB is a Post Graduate level degree programme administered by NBE in 30 Broad Specialty and 30 Super Specialty disciplines. NBE is also entrusted with the responsibility of conducting NEET – PG, NEET – SS, NEET – MDS and FMGE Screening Test. NBE administers its DNB courses through its more than 615 accredited hospitals across the country contributing to about 7783 postgraduate DNB seats, mostly in clinical disciplines. NBE offers a rapid, flexible and practical expansion potential of raising the specialist seats in the country. I think it\’s a good move by NBE to start the courses in govt institute. Gradually the seat in private sector should be scrapped by enhancing the seat in govt sector. In private sector there is no teaching, no hands on. Everything is on paper.Dnb seat in action Bala ji hospital, Kalra hospital, fortis, maharaja aggaren, appolo , mata Chandan Devi is useless.